If you choose a study path toward a bachelor of elective studies degree in life sciences, you'll take courses in biology and chemistry and pair those with an array of elective courses. You will design your degree based on your interests, even if they are in a program not specifically offered at St. Cloud State. You'll have access to an impressive array of specialized laboratories to supplement your classroom learning. You'll be taught by faculty members who are engaged in current research and who involve undergraduates in that research. You'll prepare for a future in research, education or fieldwork. Biology Tutoring Center is open weekdays. Research projects include work in immunology, invasive species monitoring and management, aquatic toxicology and animal behavior. A herbarium with a vascular plant collection especially strong in Central Minnesota counties' materials dating to the 1800s. 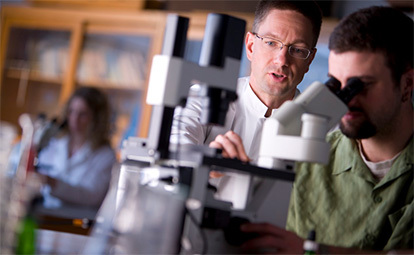 Biology faculty active in nationally-recognized research programs such as invasive species, food safety and diabetes. Faculty includes nationally-cited aquatic fauna expert Heiko Schoenfuss, who directs the Aquatic Toxicology Laboratory on campus and is a leading researcher on how contaminants disrupt aquatic ecosystems.